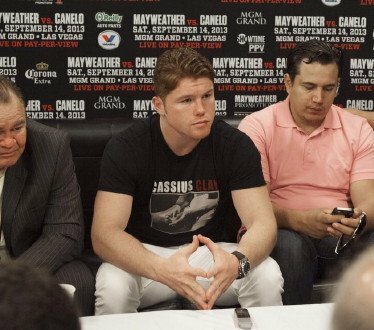 (Photo credit: Tom Casino/Showtime) Chepo Reynoso, the trainer for WBA/WBC junior middleweight champion Saul “Canelo” Alvarez (42-0-1, 30 KO’s), thinks Floyd Mayweather Jr’s long reign as the top fighter in boxing is about to end on September 14th when he faces the 22-year-old Canelo at the MGM Grand in Las Vegas, Nevada. Reynoso believes that once Mayweather Jr. has been defeated, Canelo will start his own reign as the top fighter. It’ll be his time. If Canelo is the one that is able to defeat Mayweather Jr., I’m still not exactly sold on Canelo being a fighter that can have a long reign without getting beaten every once in a while they match him tough. If Reynoso means that Canelo have a long reign as the top fighter that beats welterweights while fighting at junior middleweight and rehydrating up to 170+ for his fights, then, yes, I agree with him. Canelo will have a long reign as being the king of the welterweights. But then that begs the question: What is Canelo doing fighting welterweights when he fights at junior middleweight and rehydrates to 170. WBA middleweight champion Gennady Golovkin rehydrated to 170 for his last fight. Will Canelo’s reign be against welterweights or will he fight junior middleweights or fighters in the middleweight division? I still have doubts whether Canelo would have beaten Austin Trout if the fight were held in Las Vegas, Nevada, New York or California without open scoring. That wasn’t a performance that suggested that Canelo will have a long reign. I thought he lost the fight or at the minimum, he got a draw out of it. I guess Canelo can have long reign if he doesn’t fight Trout again, and if he mostly fights welterweights in Texas or with open scoring. However, I don’t see Canelo having kind of reign if he fights Golvokin or Julio Cesar Chavez Jr. I think both of those guys would beat him, but I also think there’s little chance that Golden Boy will make the mistake of putting Canelo in with Golovkin or Chavez Jr.
Canelo’s reign, if you want to call it that, will likely be against welterweights, and junior middleweights not named Austin Trout.